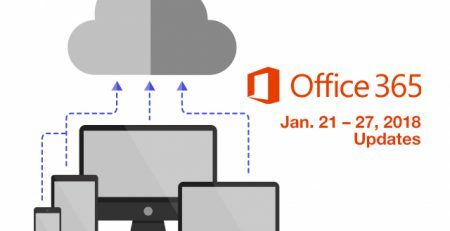 This is the December 10 – 16, 2017 weekly updates Office 365. The biggest news last week was the aforementioned calling features for Microsoft Teams. Other posts in the Blog Roundup include a look at what’s new for Office 365 in December and enhancements to sharing links and image search in Office 365. Three Teams-related videos, details on protecting email on any Android / iOS device, and updated Skype for Business training close out this week’s post. The security of ATP will now extend to SharePoint Online, OneDrive for Business, and Microsoft Teams. ATP now helps secure a broader set of workloads in Office 365, then also gains protection from advanced threats in more of your productivity workloads. New users of OneDrive that set up the OneDrive sync client will receive a one-time tutorial on uploading files to OneDrive, accessing their content via the Mobile Application, and sharing their files with others. Team members can now use StaffHub to see and access all the news for the day directly in the app. Tenant admins will now have access to usage data for all StaffHub teams in their organization. The report will include information about the size of the team, members and owners on the team, along with which devices and features each team is using. Organizations can now leverage StaffHub to distribute content to workers based on role, shift or need – making it easier for workers to access the right resources when and where they need it to do their best work. Team members can access important company news or announcements made in Yammer directly in StaffHub – allowing Firstline Workers to stay up to date and connected to the organization.